In March 2000, Frank M. Edwards, Jr. and his sons, John Bel Edwards and Daniel H. Edwards, combined their legal knowledge and varied experience to form Edwards & Associates Law Firm. As life-long residents of Tangipahoa Parish, their objective was simple – to provide competent, effective, efficient legal services to the people of the Florida Parishes region. The concept was well-received, and the firm quickly emerged as a top choice for individuals and businesses throughout the region. Frank’s vast legal experience and years of public service, Daniel’s experience as a law clerk for the U.S. Fifth Circuit Court of Appeals, and John Bel’s experience as a law clerk for the Louisiana Supreme Court allowed the firm to have a very broad practice and quickly establish a very diverse clientele. Daniel left the firm in the fall of 2003 to pursue public office. His bid for public office was successful as he was elected Sheriff of Tangipahoa Parish, a position he holds today. Daniel is the fourth generation of the Edwards family to hold this office - his father, Frank M. Edwards, Jr., his grandfather, Frank M. Edwards, Sr., and his great grandfather, Millard F. Edwards, also served as Sheriff of Tangipahoa Parish. In the fall of 2007, John Bel also pursued public office, and he was overwhelmingly elected State Representative for House District 72. John Bel served 8 years in the House of Representatives, serving both terms on the House committees for Civil Law and Procedure, Education, and Judiciary. He was also Chairman of the Special Committee on Military and Veterans Affairs. John Bel would later forego his third and final term in the House to seek higher office. In March 2008, Bradley A. Stevens, Frank’s oldest grandson, left a large New Orleans law firm to join the family practice. Brad brought with him broad experience in a vast array of practice areas that allowed Edwards & Associates, an already diverse firm, to expand its practice to better serve its clients. In January 2014, Brad became a partner at the firm, and the firm name changed to Edwards & Stevens Law Firm. Sadly, in April 2014, Frank, the family patriarch and a 50 plus year member of the bar, passed away leaving behind a tremendous legacy of legal excellence and dedicated public service. The attorneys at Edwards & Stevens constantly strive to meet the high standards and lofty expectations set by Frank when he founded the firm. The firm went through several changes in early 2016. Fresh off of an improbable victory in the 2015 Governor’s race, and prior to being sworn in as the 56th Governor of the State of Louisiana, John Bel left Edwards & Stevens to fulfill his elected duties. In January 2016, Daniel returned to the firm as an of counsel attorney. 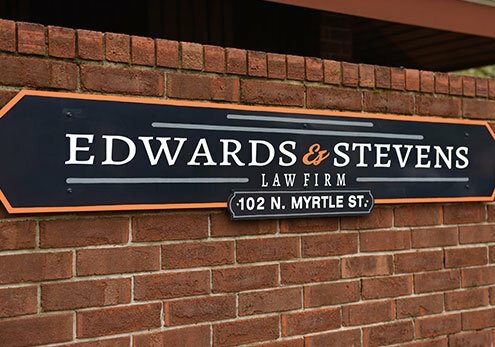 Since its inception, Edwards & Stevens Law Firm has been a family firm with deep roots in the Florida Parishes region. Our mission remains the same as the day we opened – to provide competent, effective, efficient legal representation to residents in our region.